Neutrinos are ghostly, mysterious shape-shifters. New evidence bolsters the existence of an even ghostlier, “sterile” version of this strange particle. There are three types of neutrinos in the Standard Model, the blueprint of particle physics. But in past experiments, scientists have thought there could be a fourth, more mysterious type. Results from an experiment called MiniBooNE, combined with data from another called the Liquid Scintillator Neutrino Detector, seem to add even further evidence for the existence of the sterile neutrino. Neutrinos are perhaps the second most common particle in the universe, after light particles, called photons. Physicists have long known about the electron neutrino, the muon neutrino, and the tau neutrino. They’ve also known that the neutrinos can swap identities, or oscillate, between types. And experiments seemed to observe neutrinos disappearing and reappearing, as if they’d swapped into a fourth, more difficult-to-observe identity. 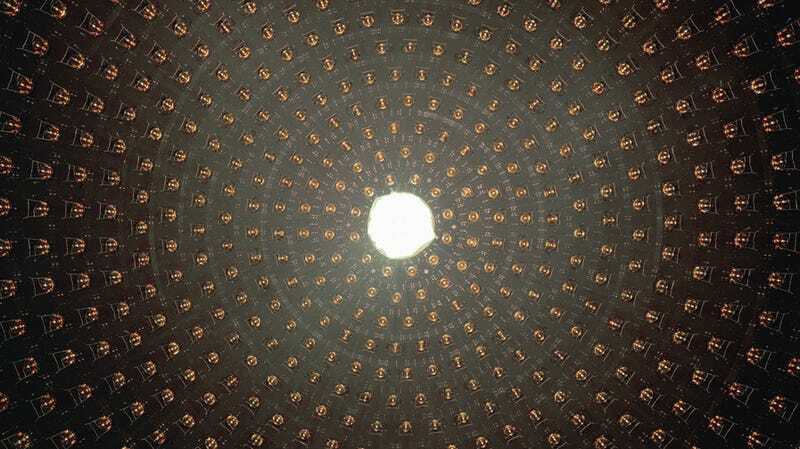 Last year, a paper cast doubt on the existence of a sterile neutrino. But a new report from scientists at MiniBooNE provides even more evidence for the particle. MiniBooNE is a detector that measures neutrinos originating from protons hitting a source at Fermilab in Illinois. It’s a 40-foot-diameter sphere, filled with over 800 tons of a special kind of oil. When electron neutrinos hit the oil, they create tiny flashes of light. Tubes turn the flashes into a signal that a computer can read. Scientists use this data to reconstruct what kinds of particles hit the sphere. The newest evidence, published last week on the arXiv physics preprint server, shows the detection of 460.5 (give or take 95.8) more electron neutrinos than expected. It appeared as though a new particle could have been appearing and then changing flavor into an electron neutrino, on top of the expected oscillations from muon and tau neutrinos. Physicists are excited and perplexed—this would be the first new fundamental particle discovered since scientists at CERN found the Higgs boson in 2012. It would also be the first particle beyond the Standard Model of particle physics. But it’s not a sure-shot yet. “It’s exciting if it’s real,” Freya Blekman, a particle physicist at CERN’s CMS experiment, told Gizmodo. She had some skepticism, since the experiment’s background noise creates the same kind of signal that a detection does, adding further possibility for confusion—and an analysis is only as good as how well it calculates that background. “However, they of course took as much care as is expected to estimate that background, I assume,” she said. There continue to be mysteries to solve in physics, and new experiments sometimes create as many questions as they answer.